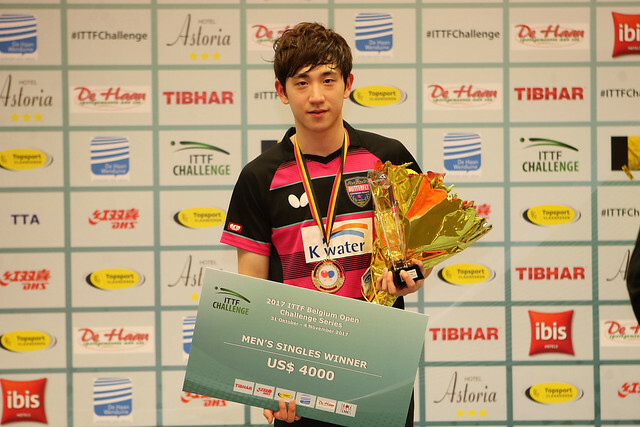 The second day of the qualification tournament for the 2017 ITTF Challenge Belgium Open has arrived and, with the main event just on the horizon, competitors in De Haan will be hoping to be at their best as the qualifying action comes to a conclusion on Wednesday 1st November. One player who is still in the hunt to take top spot in his qualifying group is Lev Katsman, who heads into the day off the back of a victory in his opening Men’s Singles group stage encounter against Danish player Rasmus Mikkelsen. Lev Katsman requires just one more win in his hunt for qualification, but the Russian should expect a stiff challenge from Puerto Rican opponent Brian Afanador who is surely the favourite to progress from the group. Another interesting tie is brewing in Group 4 as Japan’s Yukiya Uda and English representative Luke Savill prepare to do battle in a “winner takes all” scenario with both players fighting it out for first position. Competitors who achieve top spot in groups 1 through to 24 will advance to the main draw, while the winners of groups 25 to 40 will go head-to-head in a preliminary qualification round. In the Women’s Singles qualification group stage the task is slightly more straightforward with the players finishing at the top of each of the 20 groups moving through to the Round of 64 while the 20 players who achieve a second position finish and two “Lucky Losers” will compete in preliminary qualification round for a further chance to qualify. Sun Jiayi has been one of the standout competitors on the ITTF Junior Circuit in recent months and is well poised to win her qualification group at senior level in De Haan. Following a fantastic display against the host nation’s Eline Loyen in the opening fixture of Group 17, Croatia’s Sun Jiayi now turns her focus to her final group match against Tessy Gonderinger of Luxembourg in what could be an exciting duel for top spot. Belarusian contestant Alina Nikitchanka is leading the way in Group 20 and will be looking to secure her third victory as she faces home player Marie Maesen. However, the race for the runner up spot in the group remains very much in the balance as two players who hold three group points each, India’s Pooja Sahasrabudhe and Korea Republic’s Shin Jieun, meet in the concluding round of group stage fixtures. Qualification for the Men’s Doubles and Women’s Doubles categories also features in Wednesday’s action, while the Under 21 Women’s Singles qualifying group stage draws to a close.